How did a dog's breakfast get such a bad reputation? in the 1937 Dictionary of Slang and Unconventional English, the expression is listed as "a mess." It is suggested that this dates from before the time of canned dog food when a dog's breakfast consisted of dinner leftovers from the night before. This should not be confused with "a dog's dinner" which means the opposite and is normally expressed as "all dressed up like a dog's dinner" and sarcastically means over-dressed or showy. This comes from makingheadsortailsofidioms.com where the list of expressions is quite fun. 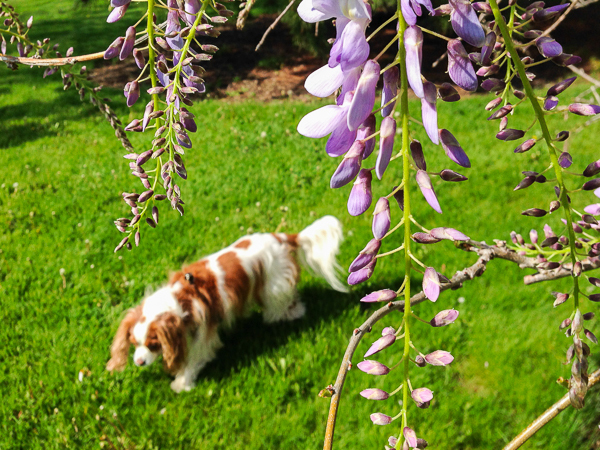 I found this picture of Dezi on a spring search under the wisteria. Is it for a dog's breakfast or a dog's dinner?